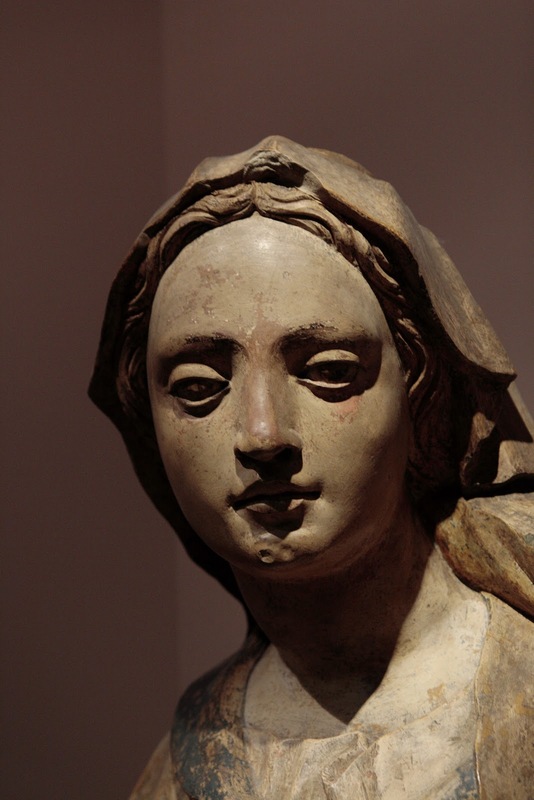 So, Mary, not really sure of what she was getting into, agreed. This young maiden who the world doesn’t even know will birth the Savior, will become part of the redemption of the world. So, the angel left and Mary stood there. What in the world have I done? I mean, I love God and all, I want to serve God, but what in the world have I done? So, she runs. She runs to a place where she knew they would take her in, where they would hold her, where they would love her. Elizabeth would have been surprised. After all, it’s not like Mary could text her and tell her she was coming! And when Mary entered, she knew. The child inside her knew. The world knew. The angels’ gossip line was going crazy! After all, the world was with child. And then Elizabeth took Mary in her arms. After all, this was not going to be easy. The world expects so much and is sometimes incredibly unforgiving, expecting too much, No one knew the road that lay ahead for the young girl but it didn’t matter. Elizabeth would be with her, to hold her, to love her, to listen to her as she worked things through. You know, that’s really what it means to be blessed—not to be showered with riches or surrounded by happiness or, God forbid, to have our lives turn out the way we plan, but rather to be held and loved as you walk this journey that God has laid before each of us. Mary’s journey mirrors ours. God calls us to change our lives, to sometimes let go of our plans and our dreams and trade them in for what God envisions that we can be. And it is there that we will be blessed. So, THIS Advent, may you be truly blessed! 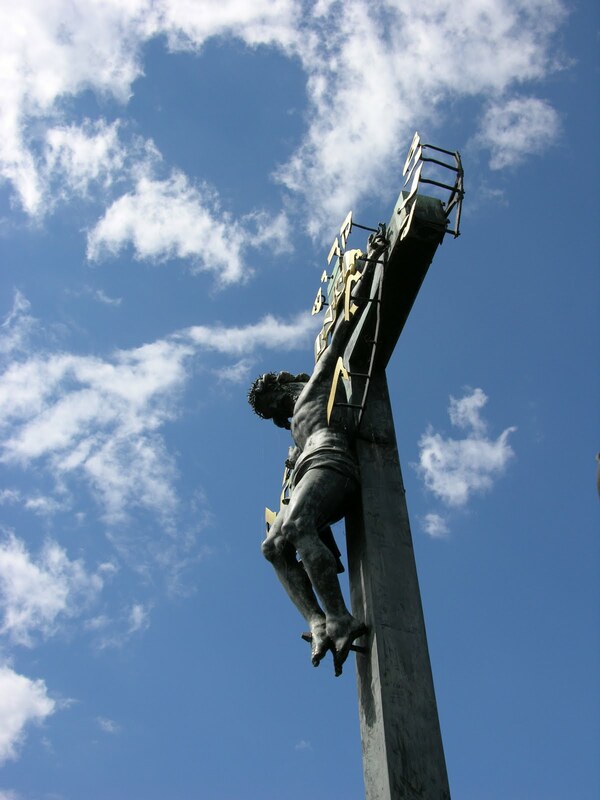 Then he handed him over to them to be crucified…So they took Jesus; and carrying the cross by himself, he went out to what is called The Place of the Skull, which in Hebrew* is called Golgotha. There they crucified him, and with him two others, one on either side, with Jesus between them. Pilate also had an inscription written and put on the cross. 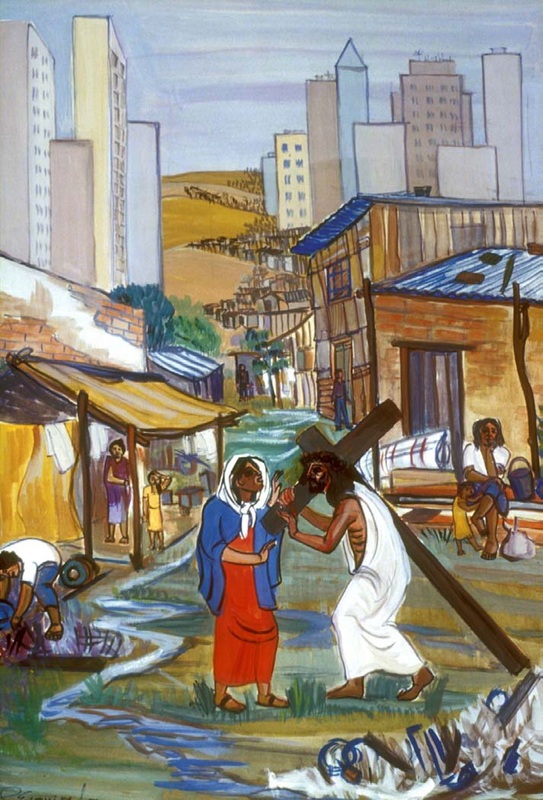 It read, ‘Jesus of Nazareth,* the King of the Jews.’…When Jesus saw his mother and the disciple whom he loved standing beside her, he said to his mother, ‘Woman, here is your son.’ Then he said to the disciple, ‘Here is your mother.’ And from that hour the disciple took her into his own home. After this, when Jesus knew that all was now finished, he said (in order to fulfil the scripture), ‘I am thirsty.’ A jar full of sour wine was standing there. So they put a sponge full of the wine on a branch of hyssop and held it to his mouth. When Jesus had received the wine, he said, ‘It is finished.’ Then he bowed his head and gave up his spirit. I am standing here but it does not seem real. I want to hold him, to comfort him, to cradle him in my arms like I did when he was a baby. But the guards are holding us back. Oh, please, I don’t think I can stand anymore. But I must stand. He has to know that I am here with him. He has to know how much I love him, how much I hurt for him, how I would trade places with him if I could. All of the memories are flooding into my head. I remember that night when the angel came to me. I did not understand. I was so afraid. But I knew I had to say yes. I had no idea what I was agreeing to do. And then for nine months I carried the baby in my womb. It was joyous. In one respect, it was just like any other pregnancy, like the others I had after that. And yet, it was different. I always felt like there was someone there with me, guiding me, loving me, helping me through it. It’s hard to explain. The birth itself was hard, downright scary in fact. We traveled to Bethlehem. It was so far, so painful. And then when we finally arrived, it was so crowded. The streets were wild. I remember that nice man who let us bed down in the room that housed his animals. I remember the first time I looked into his eyes–those dark, compassionate eyes. Even as a baby, he had compassionate, loving eyes. He was special. I knew that he was special when he came into the world. I just didn’t know how wonderful he would be. I remember the day that my cousin’s son baptized him. He didn’t know I was there. I hid behind the trees. After all, he was an adult; he didn’t need his mother always looking on. And I remember when his ministry started. He was so brave, so fearless. It scared me at times. I thought something like this might happen. But I am so incredibly proud of him. I am so proud of what he became, what he made others become that he touched in his life. He was special. No, this does not seem real. Somebody needs to help him. Please, please, he’s asking for water. Please, someone give him water. I’m afraid this is it. I’m afraid he cannot take it anymore. I’m afraid he’s going to give up. Perhaps it would be better. Perhaps it is better to let go…Oh, how I love him! How I want to go back, to hold him just once more! It is over. It is all over. He is gone. What was this for? I don’t understand. Why the angel? Why the star? Why did it all happen if it was going to end this way? What does God have in mind for him? He promised me that it would be for good. He promised me that it would be OK. I guess I have to believe that, hold on to it, hope. Someday maybe I’ll see it. I wanted to stay here until they gave me his body, but I don’t think I can. There are others here too–Jesus’ friend Mary, who has always been so lovely toward me, and the disciples. I hope they all realized how much he loved them, how he would do anything for them. The rain is really coming down now and the skies are angry, angry like me. The wind is blowing so hard, I can no longer stand against it. There are rocks and debris sliding down the mountain above us. It seems that the world is breaking apart. Will the world ever know what it has lost? Will the world ever know what it did? Will God ever forgive this world for killing my son, their son? Someone just told me that the temple curtain has split in two. It is as if the holy has spilled into the world. I can’t explain it. My son came into this world wrapped in so much hope. He was supposed to change the world. He was supposed to open the eyes of the world to what it could be, what it could become. Is it all for naught? Or, someday, will we finally understand why he came? Someday, I know, that God will make it make sense. But, now, today, I am grieving more than I could know. 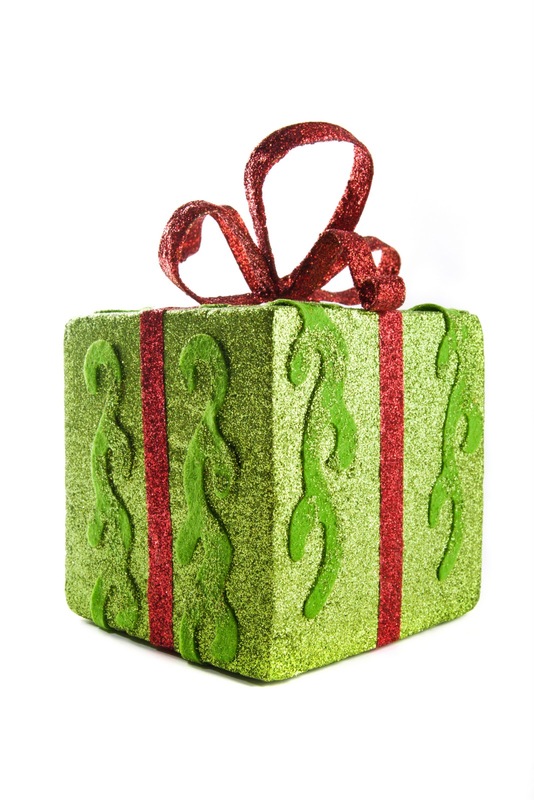 But what a gift I’ve had! What an incredible gift that was taken away all too soon! I have to leave this place, as hard as it is. Shabbat is starting in a few minutes. I must go prepare, light the candles, and usher in the joy of the Sabbath. I must go rest. I need it. I need it to resurrect my hurting soul. God will be with me. Let it be. Shalom, my dear Son! May God’s Light stay with you! FOR TODAY: On this day when we remember the Crucifixion, let us grieve for awhile and then keep vigil with the expectant hope of whatever it is God will do next! In those days a decree went out from Emperor Augustus that all the world should be registered. This was the first registration and was taken while Quirinius was governor of Syria. All went to their own towns to be registered. Joseph also went from the town of Nazareth in Galilee to Judea, to the city of David called Bethlehem, because he was descended from the house and family of David. 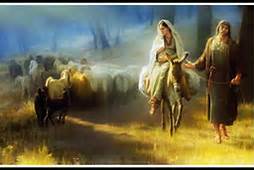 He went to be registered with Mary, to whom he was engaged and who was expecting a child. The journey has begun. We know the drill. We’ve seen the pictures of the very-pregnant Mary on the donkey with a worn-out Joseph leading the way on the road to Bethlehem. We know the story. They were going to Bethlehem, to the city of Joseph’s ancestors. Now there are reputable scholars that claim that more than likely the writers of Luke and Matthew’s Gospels were mistaken. There was not,after all, a requirement to return for this registration and so, perhaps, Jesus was actually born in Nazareth (as in the “Jesus of Nazareth”) or EVEN in a small town outside of Nazareth called Bethlehem of Galilee, a Roman-Byzantine town in the northern part of the Jezreel valley. (Again, does it matter?) But to make this story work with all the Christmas carols and the myriads of Nativity scenes, they need to go to Bethlehem of Judea. And so it becomes our journey. The 80-100 mile journey probably would have taken about 8 days if Mary was truly bouncing along on some sort of equine creature. 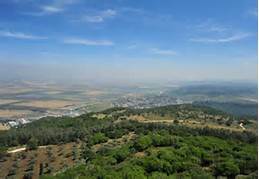 So in the second day of their journey, they would have entered the Jezreel valley south of Nazareth and journeyed along the hills of Samaria. It’s really a foreign concept to us, this traveling of about 10 miles a day or so through weather and wild animals and the certain threat of bandits and thieves as they neared what was essentially foreign territory for them. But I’ve always had this sense that they did not travel alone but rather were accompanied by other family members, townspeople, or others that would have joined them along the way. Sadly, I guess I envision traffic! I mean, after all, this thing didn’t happen in a vaccuum. Life was going on even in that moment. And life includes traffic! That’s the way journeys are. We seldom travel alone. Together, we begin to let go of what we know, leave behind our securities and all things familiar. We try to come prepared, packing as many provisions as this poor donkey can hold. And then we try our best to make our way through the sometimes-rough terrain. So, why do we go through this? Well, have you ever noticed that the entire Bible is full of people on the move, migrating from one country to another, from one way of being to another? I mean, it started with that garden story when, essentially, Adam and Eve were moved on for whatever reason. And Abraham, well he was like the journeying king, dragging his family across miles and miles of land in search of a promise. In fact, that was the whole deal. You know, “if you’ll leave your country and journey to a place that you’ve never seen and that you don’t know, this is all going to turn out.” (or something like that). And then Moses, ah…Moses…dragging hoards of people through wilderness wanderings for 40 or so years. Are you sensing a pattern here? Maybe it’s not about where we are headed but the journey itself. After all, we know this whole Bethlehem tale. We know that they’ll get there and there won’t be a place. There’s never a place. None of these people built a mansion and settled in the gated communities of their lives. They kept going, sometimes making it and sometimes never seeing the place to which they were journeying. Our journey is no different. There’s never a place. You see, God does not call us down roads that are paved with our plans and our preconceptions. God calls us instead to travel through the wilds of our lives, to journey with our eyes open that we might see this new thing that God is doing. T.S. Eliot once said that “the end of all our exploring…will be to arrive where we started…and know the place for the first time.” There’s never a place. We never really “arrive”. The journey does not end. It’s always new, re-created. That’s the point. After all, even Mary and Joseph turned and made their way home. But they were never the same again. And the baby that is coming? Well, he was never meant to settle down and stay put. And there was never really room for him at all. God didn’t intend to show us how to build a house; God revealed the journey home and threw in traveling mercies on the way. So, let us go and see this thing that the Lord has made known to us! Reflection: What will you take on your journey? What should you leave behind? How do you envision your journey today? In the sixth month the angel Gabriel was sent by God to a town in Galilee called Nazareth, to a virgin engaged to a man whose name was Joseph, of the house of David. The virgin’s name was Mary. And he came to her and said, ‘Greetings, favoured one! The Lord is with you.’* But she was much perplexed by his words and pondered what sort of greeting this might be. The angel said to her, ‘Do not be afraid, Mary, for you have found favour with God. And now, you will conceive in your womb and bear a son, and you will name him Jesus. He will be great, and will be called the Son of the Most High, and the Lord God will give to him the throne of his ancestor David. He will reign over the house of Jacob for ever, and of his kingdom there will be no end.’ Mary said to the angel, ‘How can this be, since I am a virgin?’* The angel said to her, ‘The Holy Spirit will come upon you, and the power of the Most High will overshadow you; therefore the child to be born* will be holy; he will be called Son of God. What if Mary had said no? What if her fear or her plans had gotten the best of her? What if she was just too busy planning for whatever was going to happen next in her life? What if she really didn’t have time to do any pondering today? Now, as much as we’d like to think that we have the whole story of God neatly constructed between the covers of our Bible or on that nifty little Bible app that you have on your iPhone, you and I both know that there is lots of God’s work that is missing. We really just sort of get the highlights. Who knows? Maybe Mary wasn’t the first that God asked to do this. Maybe she was the second, or the tenth, or the 386th. After all, this is a pretty big deal. I mean, this pretty much shoots that long-term life plan out of the water. But, you see, this story is not about Mary; it’s about God. And through her willingness to ponder, her willingness to let go of the life that she had planned, her willingness to open herself to God’s entrance into her life and, indeed, into her womb, this young, dark-haired, dark-skinned girl from the wrong side of the tracks in a sleepy little suburb of Jerusalem called Bethlehem, was suddenly thrust into God’s redemption of the world. It is in this moment that all those years of envisioning what would be, all those visions that we’ve talked about, it is here, in this moment, that they begin to be. Annunciation literally means “the announcement”. The word by itself probably holds no real mystery. But it is the beginning of the central tenet of our entire Christian faith—The Annunciation, Incarnation, Transfiguration, Resurrection. For us, it begins the mystery of Christ Jesus. For us, the fog lifts and there before us is the bridge between the human and the Divine. Now we Protestants really don’t tend to give it much credence. We sort of speed through this passage we read as some sort of precursor to “In those days a decree went out from Emperor Augustus…” so we can light our Christmas candle. This, for us, is the typical beginning of the birth story. But think back. Something happened nine months before. This human Jesus, like all of us, had to be grown and nurtured in the womb before the miracles and the ministry started. The Feast of the Annunciation is the turning point of human history. It is in this moment, this very moment, that God steps through the fog into humanity and, just like every human that came before, must wait to be fully birthed into this world. What about us? When do you let yourself ponder? When do you expect to encounter the unexpected? What is your answer when the angel or some other God-sent character comes bursting into your life: “Excuse me [You], I know that this might be a little out of the box for you but I need you to stop everything that you’re doing and listen. God has something special just for you. See, if it’s not too much trouble, we’d like you to birth the Savior, the Son of God and the Son of Humanity, Emmanual, the Messiah, the very Godself into being. And, we’d really like to get this show on the road now.” Again, what if Mary had said no? So, why are we so different from that scared little girl. So, maybe it’s time for us to get busy pondering! Mary pondered these things in her heart, and countless generations have pondered them with her. Mary’s head is bowed, and she looks up at the angel through her lashes. There is possibly the faintest trace of a frown on her brow. “How shall this be, seeing that I know not a man?” she asks, and the angel, the whole of Creation, even God himself, all hold their breath as they wait for what she will say next. “Be it unto me according to thy word,” she says, and jewels blossom like morning glories on the arch above them. Everything has turned to gold. A golden angel. A golden girl. They are caught up together in a stately golden dance. Their faces are grave. From a golden cloud between them and above, the Leader of the dance looks on. The announcement has been made and heard. The world is with child. Reflection: What is God asking you to do with your life? What part of the story is yours to play, or yours to write, or yours to live? When have you taken time to ponder? We love this passage. It is Mary’s Song, the poetic rendering of her realization that she has truly been blessed, that she has been called to do what no one else has done, what no one else will do. She has been called to give birth to God in this world, to deliver the promise that her people have always known. But, lest we overly-domesticate the young girl that we know as Mary, these words attributed to her are downright radical. This is a strong and faithful young woman who is responding to her call not just to birth a baby into the world, but to also open the doors to the eternal as it comes flooding in. She is the forerunner, the one who opens the door that so many have tried desperately to nail shut then and even now. She has brought God’s Presence into something that we can see, that we can fathom. But it comes with a price. No longer can we continue to live our lives as we have. God will scatter the proud, those who think they have it figured out, those who are so sure of their rightness and their righteousness. In other words, those of us who think that we have it all nailed down will be shaken to our core. The powerful–those with money, those with status, those with some false sense of who they are above others–will be brought down from their high places. The poor and the disenfranchised, those who we think are not good enough or righteous enough, will be raised up. They will become the leaders, the powerful, the ones that we follow. The hungry will feel pangs no more and those who have everything–the hoarders, the affluent, those are the ones whose coffers will be emptied to feed and house the world. God is about to turn the world upside-down. Look around you. This is not it; this is not what God had in mind. And God started it all not by choosing a religious leader or a political dynamo or even a charismatic young preacher but a girl, a poor underage girl from a third-world country with dark skin and dark eyes whose family was apparently so questionable that they are not mentioned and whose marital status seemed to teeter on the edge of acceptable society. God picked the lowliest of the lowly to turn the world upside down. There will be no more days like today when we remember the first anniversary of the worst mass school killing in our history. Never again will we remember 20 children and 6 adults who did not have to die before their lives were filled. The woman who came through my neighborhood Wednesday night looking through the trash cans for food will have more than the meager pasta and sauce and peanut butter and apples and bananas and crackers that I hastily threw in a bag for her. No more soldiers and no more children that were just in the wrong place at the wrong time will die in needless violence as we fight for control of this world or attempt to insure that weapons of mass destruction will not be used against us. There will be no more illness or death because someone could not afford medical care or because they live in a place that does not provide it. There will be no young people who cannot get a good and solid education with the best resources and technical support that our world and our brains now offer. Our earth will no longer cry in pain as we consume resources beyond what we need and throw the rest away. And each of God’s creatures–human and others–will have what they need and the relationships that they need to become what God calls them to be. In other words, everyone will know, finally, that they have a home. he visits and redeems us, he grants us liberty. God shall fulfill his promise and bring his people peace. 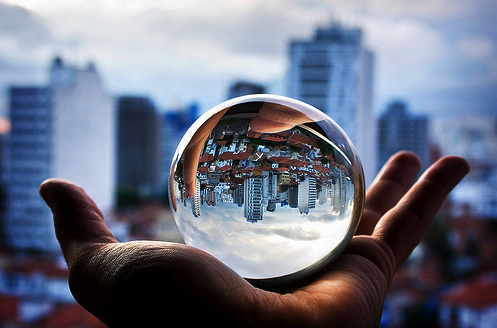 Reflection: What part of God’s vision are you called to bring? What in your life do you need to turn upside down? In other words, what do you plan to do with this life you’ve been given? The hurt in Mary’s eyes is evident. This is her son. This was the child that she carried in the womb, birthed into the world in the rough hues of that cold desert night shielded only by a stable, or a cave, or a grotto, or something of the like. This was the child that she nurtured and saw grow into a young man. This was the child that she never understood, the one who seemed to choose his own path, the one who even at a young age always seemed to have some sort of incredible innate wisdom. This was the child that would rather sit at the feet of the rabbis, would rather soak in all of the eons of lessons, than play like the other children. This was the young man that had made her so proud, full of compassion and empathy, always thinking of others, always standing up for the poor and the outcast. This was the young man who had more courage than she had ever seen. Where did he get that? She remembers that night long ago in Bethlehem. They almost didn’t get there in time. They almost didn’t have a place. But there he was. Even the first time that she looked into his eyes, she knew. This child was different. Born of her and, yet, not really ever hers. He always seemed to belong to something bigger. But she could pretend. She could think that he was hers. And she could love him more than life itself. And now, today, the pain is almost to great to bear. It looked like this was it. Was it all for naught? After all, she herself had given up so much. What meaning did it have? Why was it ending so soon? It couldn’t be time to give him back–not yet. This station is another one that is considered “non-canonical”. But we know that Mary was there. Love would put her there. Love would make her want to pick him up and hold him, cradle him like she did that cold Bethlehem night. The station is marked with a relief carved in stone. The church next to it still has the mosaic floor from an earlier Byzantine church that stood on the premises. In the floor is an image of a pair of sandals facing north, supposedly marking the place where Mary stood in suffering silence when she saw her son carried on the cross. The Mary we know is usually silent. With the exception of that story of the wedding at Cana when she told Jesus to fix the problem with the wine, she is usually depicted as almost stoic. I don’t think stoicism has anything to do with it though. 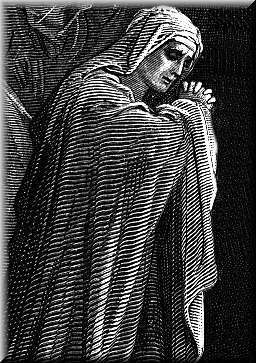 Mary’s grief and pain were real. When Jesus encountered her this one last time, they both knew it. And they both felt Mary’s deep, unending, nurturing love. Perhaps that is what we are to glean from this–that in the midst of one’s grief and pain and unbearable loss is the deepest love imagineable. We see it in Mary and we know that at this moment, this is what God is feeling too. After all, both have given themselves for the world and both are shattered that the world is throwing their love back. At this point, nothing need be said. The love is evident–the love of Mary, the love of God. It is a love that we must experience–self-giving, suffering, silent–if we are to understand who God is and who God calls us to be. It is the love that we are called to have for one another, a love that in the deepest of grief pulls us up and pulls us through, a love that would compel us to stand up for another, a love that, finally, creates room, a love that is of God. So, in this Lenten season, let us, finally, learn to love one another. And he came to her and said, “Greetings, favored one! The Lord is with you.”But she was much perplexed by his words and pondered what sort of greeting this might be. 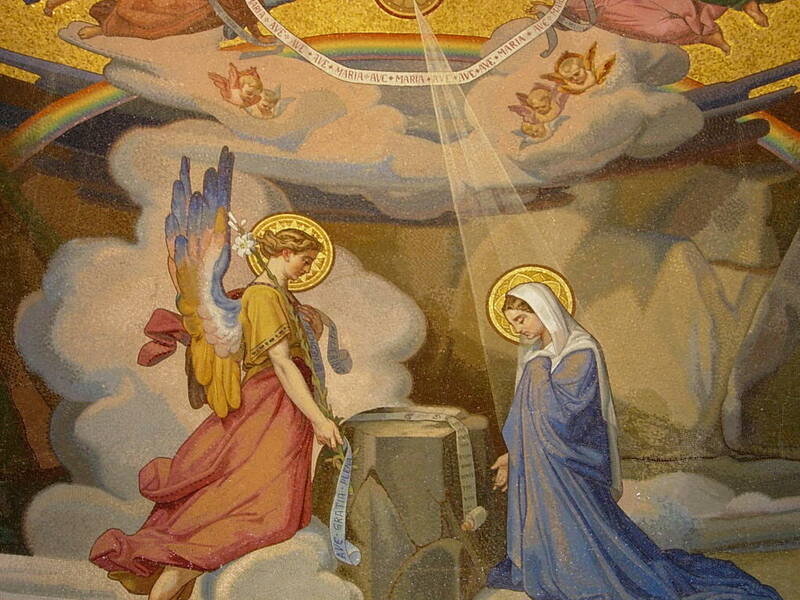 The angel said to her, “Do not be afraid, Mary, for you have found favor with God. And now, you will conceive in your womb and bear a son, and you will name him Jesus. He will be great, and will be called the Son of the Most High, and the Lord God will give to him the throne of his ancestor David. He will reign over the house of Jacob forever, and of his kingdom there will be no end.” Mary said to the angel, “How can this be, since I am a virgin?” The angel said to her, “The Holy Spirit will come upon you, and the power of the Most High will overshadow you; therefore the child to be born will be holy; he will be called Son of God. And now, your relative Elizabeth in her old age has also conceived a son; and this is the sixth month for her who was said to be barren. For nothing will be impossible with God.”Then Mary said, “Here am I, the servant of the Lord; let it be with me according to your word.” Then the angel departed from her. Of course, this was not in the plan. She was supposed to get married, have children, and live our her life in quiet anonymity with the quiet and little-known Joseph. She knew what her life was going to hold. So, when God’s Presence suddenly is revealed, breaking into her quietly-orchestrated little world, of course she was afraid. After all, things were never going to be the same. There would be no going back and the way forward was murky at best. And so, Mary hesitates, if only for a moment. The angel, God, all of Creation, the existence of all who would come after her, hangs, suspended, not moving. The world stops, straining to hear the Word. Things would never be the same again. History was at this moment shifting and swaying, not sure of what it would become. So, she takes a breath–one last breath as the quiet girl Mary. And with a voice that shakes all of eternity, she responds, “Here am I, the servant of the Lord; let it be with me according to your word.” “YES.” Nothing would ever be the same again. In this season of Advent, give yourself the gift of being virgin enough to move forward, of being open to birthing the Christ into your life, of forming the holy and the sacred on your lips and then speaking the “Yes” that God and the whole world is waiting for you to speak.